Landscape professionals and homeowners alike will find plenty of uses for lawn sweepers. This is a tool that will help with everything from lawn cleanup to parking lot cleanup. Keep reading and we’ll show you how Sweep-All’s lawn sweepers work. Farmers find lawn sweepers handy for manure cleanup. Event planners and other professionals in the event planning industry use these sweepers for event cleanup, to prepare the venue and afterward. Parks departments put yard sweepers to work on park cleanup. School maintenance professionals use sweepers for school cleanup, especially on playgrounds, sports fields and in parking lots. Homeowners love tidy yards, so landscapers often use yard sweepers to not only remove grass clippings, but to sweep leaves, pine needles and other debris. All of the jobs outlined above are traditionally done with a rake or broom. Though as anyone who has spent time raking a yard knows, this is a time-intensive process. Raking and sweeping by hand can take hours. 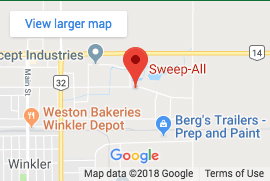 However, since Sweep-All’s sweepers are designed to be pulled behind a riding mower or small tractor, you can speed the process simply by driving over the areas that need to be swept. If raking gives you a backache, then you’ll appreciate a pull-behind sweeper that does the hard work for you. Sweepers also drastically cut labor costs, especially when large areas need to be swept or a lot of debris needs to be moved. You’ll save your business money, and you’ll be able to offer services to homeowners and venue owners at a lower cost, which is something they’ll love. Some of these jobs can also be handled with tools like leaf blowers, but yard sweepers come with advantages even over a leaf blower. Blowers can throw small stones and other bits of debris that can break windows. Blowers are also much more difficult to direct. Leaves and clippings may not end up where you want them. Plus, once you’ve piled the leaves or grass clippings, they still need to be bagged and hauled away. Our sweepers collect clippings and debris in a convenient hopper that makes debris disposal easy. Why Choose a Sweep-All Sweeper? Sweep-All sweepers feature adjustable broom speeds and heights, making our sweepers versatile. Adjust the broom to suit whatever job you need to tackle next. Both the HMW and TPW Series feature heavy-duty construction for commercial applications as well as options for electronically controlled hopper dumps, which means the hopper can easily be emptied without climbing down from the tractor. Most yard sweepers are ground-driven, but Sweep-All’s products are powered either by a Honda engine (for the HM and HMW models) or they are PTO-driven (the TPW model). Lots of sweepers on the market are made with light steel construction and plastic parts, which shortens their life span. Yet Sweep-All’s sweepers are built from heavier steel, which means they’ll last much longer. If you’re in the market for a yard sweeper, then check out Sweep-All’s products today! You’ll find more information on our website. Don’t hesitate to contact us if you need help choosing the sweeper that’s right for you.